With the LaCie Rugged RAID, you get it all in one package – with zero tradeoffs. It delivers a game-changing blend of PC and Mac compatibility, capacity, speed, mobility, and reliability. As the ultimate solution for on-the-go professionals, the LaCie Rugged adapts to your needs for performance or complete data security. Get blindingly-fast transfer speeds on both Mac and PC with USB 3.0 and Thunderbolt interfaces. Back up and transfer huge quantities of data in a fraction of the time. Luxuriate in obviously more responsive photo library browsing. 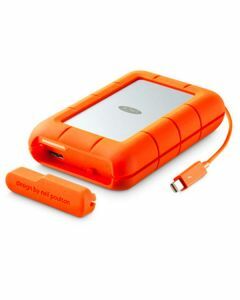 The LaCie Rugged, with the SSD version, delivers up to 387 MB/s – one of the fastest bus-powered products available on the market. The hard disk version delivers 4TB of storage and performs at up to 122 MB/s, a 35 per cent improvement over FireWire 800. 5400 RPM drives guarantee a minimum of 64MB of cache for premium performance and seek times. 34 x 91 x 148 mm / 1.3 x 3.6 x 5.8 in.